ORDER NO. SO (SE-1)1-38/2019 dated Lahore, the 31st January 2019 regarding Principal High School Order of Ex-Acting CEO District Education Punjab by a government of the Punjab school education department. 1. Mr. Bashir Ahmed Zahid Goraya (BS-19), Ex-Acting CEO, DEA, Gujranwala adjusted as Principal (BS-19), Govt. Junior Model High School, Model Town Lahore. 2. Mr. Rana Ahmed (BS-19), Ex-Acting CEO, DEA. 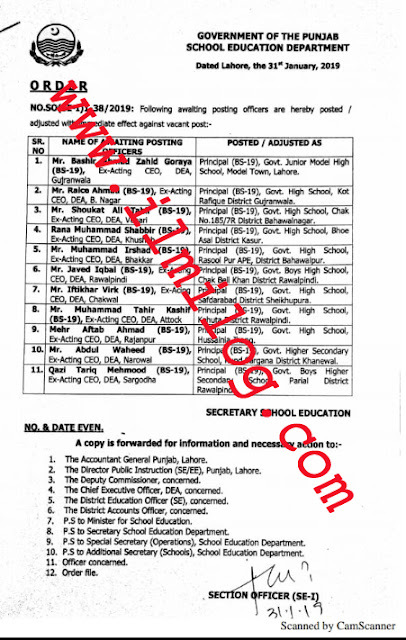 B. Nagar adjusted as Principal (BS-19), Govt., High School Kot Rafiq District Gujranwala. 3. Mr. Shaukat Ali Tahir (BS-19) Ex-Acting CEO DEA, Vehari adjusted as Principal (BS-19), Govt High School, Chak No.185/7R District Bahawalnagar. 4. Rana Muhammad Shabbir (BS-19), Ex-Acting CEO, DEA, Khushab adjusted as Principal (BS-19). Govt. High School Bhoe Asal District Kasur. 5. Mr. Muhammad Irshad (BS-19), Ex-Acting CEO DEA. Bhakkar adjusted as Principal (BS-19), Govt High School Rasool Pur APE, District Bahawalpur. 6. Mr. Jawad Iqbal (BS-19), Ex-Acting CEO DEA. Rawalpindi adjusted as Principal (BS-19). Govt. Boys High School Chak Beli Khan District Rawalpindi. 7. Mir. Iftikhar Virk (BS-19), EX-Acting CEO DEA, Chakwal adjusted as Principal (BS-19). Govt. High School Safdarabad District Sheikhupura. 8. Mr. Muhammad Tahir Kashif (BS-19) EX-Acting CEO DEA, Attock adjusted as Principal (BS-19). Govt. High School Kahuta District Rawalpindi. 9. Mehr Aftab Ahrnad (BS-19), EX-Acting CEO DEA, Rajanpur adjusted as Principal (BS-19). Govt. High School Hussainia Jhang. 10. Mr. Abdul Waheed (BS-19) EX-Acting CEO DEA, Narowal adjusted as Principal (BS-19). Govt. High School Kund Sargana District Khanewal. 11. Qazi Tariq Mehmood (BS-19) EX-Acting CEO DEA, Sargodha adjusted as Principal (BS-19). Govt. High School Partial District Rawalpindi. SECRETARY SCHOOL EDUCATION 1. The Accountant General Punjab, Lahore. 2. The Director Finer Instruction (WEE), PIMA, Lahore 3. The Deputy Commissioner answered. 4. The CNN Executive Moir, DEA, concerned. 5. The District Education Officer (SE), concerned. & The District Accounts officer, concerned. 7. PS to register for School Education. S. PS to Secretary School Education Department 9. PS to Special Secretary (Operations), School Education Department 10. PS to Additional Secretary (Schools), School Education Department 11. Officer concerned. 12. Order fie.